Hey guys! So because the FIFA World Cup finals are on Sunday (Argentina Vs. Germany…or aka Messi vs. German Powerhouse), I decided to quickly sneak this feature article in on the FIFA World Cup’s Goal-line Technology. Ready, set, goal- or is it? Goal-line technology for soccer. What the heck is that? Well, in honor of the FIFA World Cup in Brazil in which many countries are competing (sadly no longer the United States) I’d thought it’d be interesting to discuss a kind of technology that has helped to change the game. Now, let’s be honest-humans are not perfect. And sometimes, accidentally, we make error. The fact is that human error is part of the beauty of who we are. This is can impact our lives in a small way-and sometimes, in a big way. For example-sports fans, how many of you have screamed at a TV in frustration when a referee has made a wrong call in a game? You know that they’re wrong-or at least that’s what you believe-but how do you prove it? And that’s the annoying thing-there isn’t any way to do it, except now there is. Goal-line technology changes all of that. But you’re if anything like me, and not a soccer super-star, you’re probably wondering what exactly there is to prove? I mean, if the ball goes into the net, it’s a goal. Done. Nope, not done. You see, technically the ball only needs to pass the posts on either side of the goal to be counted as a goal, and sometimes goalies throw the ball out after they’ve passed the posts. Without goal line technology and only with a grainy video of what happened, you can’t truly prove that it was or wasn’t goal. And that’s been a problem forever-that is, until now. The technology first came into play in the 2014 World Cup in the match between France and Honduras. The goal line technology determined the ball’s flight path and accurately analyzed whether or not it was actually a goal-and it was! Hurrah goal-line technology! So how exactly does it work? Goal-line technology is a collection of systems designed to monitor the ball’s flight path and determine whether it has crossed the line for a goal. There are tons of systems approved by FIFA, but they’ve decided to use the German GoalControl 4-D. Basically, there are 14 pretty awesome cameras around the entire stadium, with seven pointed at each goal, to perpetually capture the ball in 3D when it comes near the goal. It filters out players when taking shots, and is accurate down to the last millimeter. Frankly speaking, it’s the last word in soccer…er.. football technology. Technically, awarding the goal is still down to the referee dude (of course humans gotta feel important) but goal-line technology helps them to make that decision in an unbiased way. The referee dude has a little watchy-thingy on his hand which alerts him, based on the goal-line technology if or if not the play was a “goal”. So what’s the HoneZone Take? This is the end of terrible endings for really sad teams who deserved a goal but didn’t get it. You probably don’t care if you’re not a soccer player, but imagine for a moment that was all you had worked for. It would probably matter a whole lot more to you than it does now. And forget the soccer aspect. Let’s think about the technology. I mean, 12 years ago, would anyone imagine such a thing would exist at a world cup? Probably not. 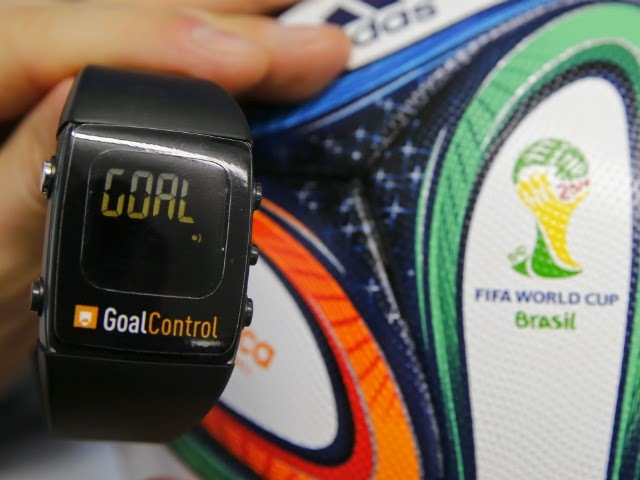 Goal-line technology is a huge leap for technology, for the World Cup, for football, and for it’s players. It shows that not only can we use technology for things like cellphones and tablets, but for games that mean a lot to us as well. If you’re interested in taking your first start to building technology just like this, then join a class at HoneZone Technology Academy! It’s your first leap into the world of technology!